Buy VeloView Prism on Amazon Prime! 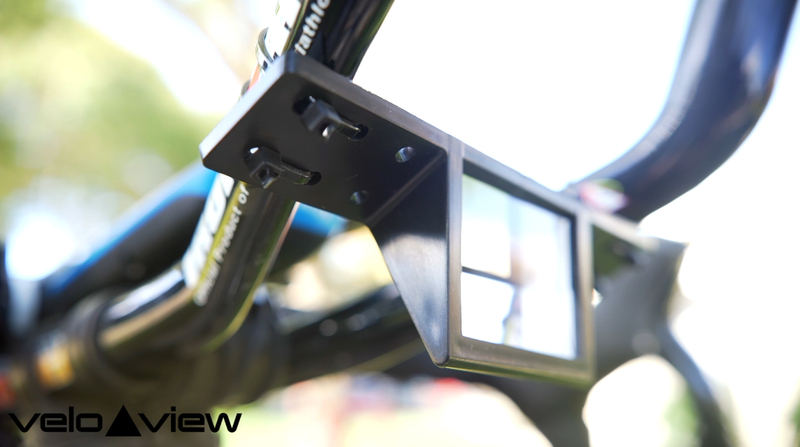 The VeloView prism allows you to Ride Safer, Ride Faster and Ride More Comfortably. See More!Buy Now with Prime! Don’t take our word for it! Watch the Video and See For Yourself! Click to Watch The VeloView Prism in Action! A VeloView Prism, mounted on your bike, allows you to see the road ahead while you maintain your heads down/aerodynamic position. Reduce strain on your neck and back while riding Safer, Faster, and More Comfortably with The VeloView Prism. Behind every great product is a great mind, and behind the Velo View Prism there just happens to be two great minds. Carl received a Bachelor’s degree in Engineering at Case Western Reserve University, a Masters Degree at Marquette University, a PhD at Northwestern University, and a MBA at Cleveland State University. Carl taught engineering at the University of Cincinnati before returning to the corporate world. Carl’s analysis and design experience ranged from torpedo and rocket systems to blood diagnostic equipment. Carl is now retired and lives in Naples, Florida with his wife of 35 years, Carol Harrison. Larry attended Michigan State University and Louisiana State University Medical School, and did his residency in Birmingham Alabama. He practiced Internal Medicine in Zachary Louisiana and Emergency Medicine in both Baton Rouge and Naples Florida. Larry joined the US Army late in life, deployed to Iraq, practiced medicine at Fort Campbell Kentucky, and ran Emergency Services at Blanchfield Army Community Hospital. 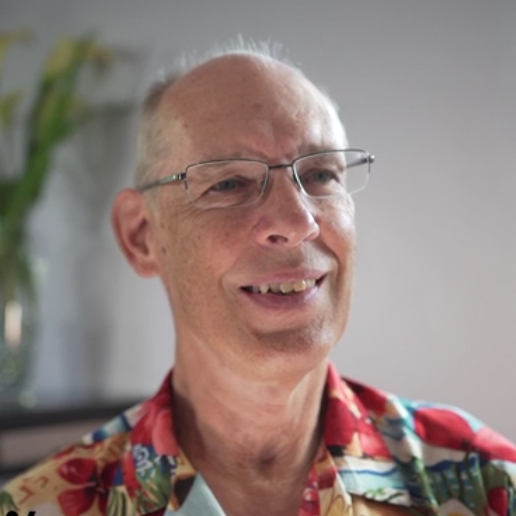 Larry returned to Naples Florida where he continues to practice Emergency Medicine. 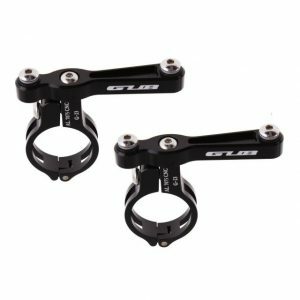 No Aerobars – No Problem! 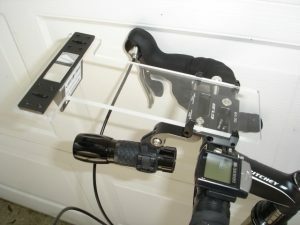 Here’s how to mount a VeloView Prism using either a Narrow Acrylic plate and a pair of GUB G-23 water bottle mounts; or a ‘T’ Shaped Acrylic plate and one GUB G-88 cell phone mount. Additionally, the plates give you a platform for mounting a phone or GPS unit. Click the pics for drawings of the respective Acrylic plates. it gives me a constant view of what’s ahead of me when using aerobars on my road bike without straining my neck. The field of view is somewhat limited due to the nature of prisms but it is adequate for my needs. your device will also let me stay in the tri position – which is the only thing that prevents my hands going numb. and I am constantly aware of my surroundings which means I keep my eyes moving from my rear view mirror to my prism and checking for other traffic which includes side streets and turning traffic. I have been riding with the VeloView Prism for over a year. It has dramatically improved my speed when I am pulling. I cannot imagine riding without my VeloView Prism. I have also watched other riders lose focus on the road and almost hit objects in the road. This not only creates a risk for them but also creates risk for those following. I had a close encounter with a large truck parked in my bike lane. Fortunately I was able to stop in time but that one experience was enough motivation for me to seek out this prism and it serves its purpose. Comme un avantage sur la sécurité. J’ai décidé d’essayer “VeloView” qui est un prisme attaché au guidon, ce qui nous permet de voir ce qui se trouve devant soi lorsque nous sommes en position aérodynamique la tête baissée. C’est un outil secondaire puisque nous devons toujours avoir conscience de ce qui nous entoure, mais la sécurité accrue est un facteur important. Merci. and have enjoyed it very much. I particularly like it when I am on long straightaways or riding into the wind. I have a fused neck with a plate from an old car accident. Didn’t take up long distance riding until I was 71 and 4 years later love it. 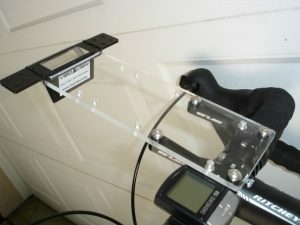 The install of the aerobars really added to my comfort and speed, but my neck does not like lifting my head up to see. I remember my father had a prism that fit on the visor of the car allowing him to see traffic lights when stopped below them. I keep searching the web and calling bike shops. I stumbled on your site today. Thank You. I am a triathlete training for long events. I use my aero bars but I have found it hard to maintain an aero position for long periods. The Prism has allowed me to stay on my bars and remain comfortable. My times have gotten better and I feel better. It was easy to install and although it took a few rides to be totally comfortable with this device I can’t imagine riding without it now. I would recommend it to any triathlete or other person using aero bars. VeloView is for you! I’ve been using it for about 3 years and just received my second one for my new bike. It lets me maintain a more aerodynamic position for longer periods of time and lets me increase my speed. No need to pick up your head to see in front of you. 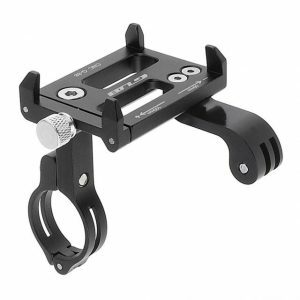 Everyone with aerobars should have one. Is it big enough to give a useful field of view? Scanning up/down, left/right, gives you a large field of view. Is it hard to get used to? Just like using a rear view mirror, there is a learning curve. You first learn to trust it, then you learn to not depend on it. Does it block your field of view? It is a lot smaller than an aerobar mounted water bottle. And yes, that’s where I mount my water bottle! Would you move your water bottle for another 0.5 – 1.0 MPH? Shermer's Neck? What the Heck? 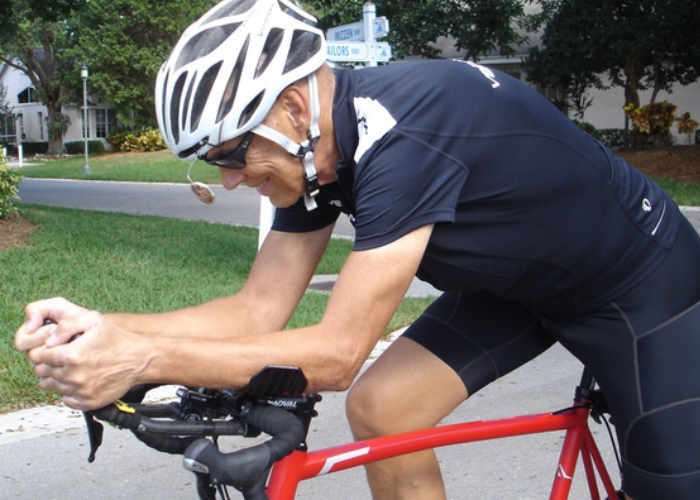 Paul Danhaus was feeling strong, well into his inaugural Race Across America. The brutal cycling event is a non-stop, 3,000-mile journey from Oceanside, California to Annapolis, Maryland. Most solo riders get about an hour of sleep per day, then spend the rest of the time pedaling across the nation. The winners typically finish in about eight days. Danhaus was about 1,000 miles into the 2009 race, rolling through the plains of Kansas, when he suddenly felt something weird. He may have been tired, but that wasn’t why his head wasn’t staying up. Instead, Danhaus was suffering from Shermer’s Neck, a fascinating ailment that affects cyclists who ride unusually long distances. To sum it up cleanly, Shermer’s Neck is a condition where the neck muscles fail from fatigue and can no longer support the head. It is not a gradual ailment, either: after first feeling the symptoms, the neck will usually give out within two hours. Danhaus had about an hour’s notice before his neck stopped working. He still had about 2,000 miles left in the race. The Race Across America started in 1982, when it was called the Great American Bike Race. Four cyclists raced from Santa Monica, California to New York City in the inaugural event. One of those competitors was Michael Shermer. He finished the race in 1982 (though he didn’t win) and tried it again in 1983. About 2,000 miles into the ’83 race, Shermer suddenly was unable to hold his head up, and he was forced to prop his chin up with the palm of his hand to keep going. A new medical condition—called “Shermer’s Neck”—was named, and all it took was a 3,000-mile nonstop bike ride across the vast United States to discover it. 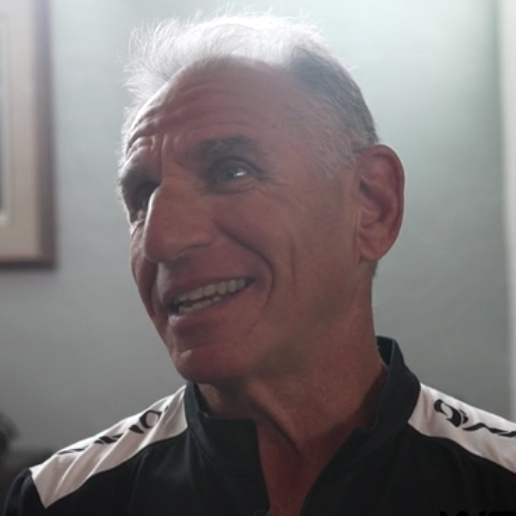 It is a rare ailment for endurance athletes simply because most will never be on a bike for the 500-plus mile minimum it takes for Shermer’s Neck to pop up. Even then, Shermer’s Neck doesn’t happen to most ultra-distance competitors. But it does frequently pop up among participants in both the Race Across America and Paris-Brest-Paris, a famous 1,200K brevet (745 miles) in France. Though what exactly causes it isn’t fully known, theories like posture on the bike have been discussed. But just knowing the possibility of Shermer’s Neck exists forces most ultra-distance cyclists to have a solution in place to deal with it. In Danhaus’ case, he had no pain associated with his case of Shermer’s Neck, though he does admit he was in a zone that didn’t allow him to even acknowledge any pain he may have been feeling. For Danhaus, it was simply a case of the neck refusing to hold the head up any longer. In most cases during ultra-distance bike races, Shermer’s Neck does not go away for the remainder of the ride. But most of the time, cyclists continue on despite the muscle failure. In that regard, Danhaus says that Shermer’s Neck is more of a bizarre ailment rather than a crippling one. To him, compared to major saddle sores or hip problems or knee problems, Shermer’s Neck is no big deal. That is, if you’re prepared for it. The popular solution for Shermer’s Neck is a brace that’s wrapped around the cyclist’s torso, with a metal pole that goes up the cyclist’s back and attaches to the bike helmet. Ideally, the head will be dangling off the pole and it allows the cyclist to continue looking straight ahead while riding. A member of Danhaus’ crew tried this, but the crosswinds of the Great Plains made it ineffective, because Danhaus’ head kept rocking from side to side. So he dismounted and the crew huddled up. “I said, ‘Well, take my aero bars and rotate them up,'” Danhaus said. The crew shifted his aero bars so they were straight above the handlebars, then wrapped the top of them with toilet paper and covered the toilet paper in duct tape to keep it in place. Danhaus then put his chin on top of the contraption and kept riding. A simple Google image search of Shermer’s Neck shows other creative ways to work around the ailment, including one that combines the Danhaus crew’s two ideas and sends a metal pole up the back, then has an elastic band wrapping around each side of the cyclist’s head that form a chin strap to rest the head on. Another example was discussed in the New York Times involving female competitor Leah Goldstein. When her neck failed, her crew braided tape into her hair and tied it to her heart-rate montior or bra to prop her head up. With his head resting on the makeshift aero bar chin rest, Danhaus kept pedaling toward Annapolis. He finished the 3,000-mile journey in 11 days, 11 hours and 51 minutes. He was 60 years old, the oldest of all the 2009 entrants. By that point, his body was used to the sleep deprivation. He fell asleep after the race finished but only got two hours in before waking up. And his neck still wasn’t working. “On the drive home, I stopped at a drug store and got one of those neck collars for whiplash to help keep my head up,” Danhaus said. He returned to his full-time job as a veterinarian surgeon, but still had problems doing his work because his neck was not back to full strength. He frequently visited the chiropractor to try and speed up the recovery. “It took three or four weeks before I could really keep my head up,” Danhaus said. “But even then, if I went out for six- or seven-hour bike ride, it would still be weak. It gradually returned, but it took weeks. Danhaus has competed in 500-mile events since the 2009 RAAM, and has not had any problems with his neck in those rides. He’s hoping to compete in the RAAM again in the future, knowing that Shermer’s Neck might pop up once again. For the extreme ultra-distance cyclists, it’s always a possibility.